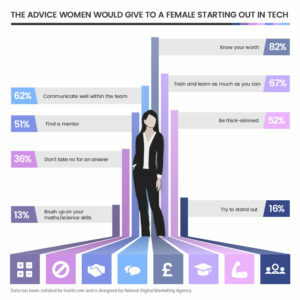 In analysing Ivanti’s report, Reboot Digital Marketing Agency felt inspired to highlight the advice women would give to young women starting a career in tech. To achieve this, Reboot designed a graphic to showcase data collated by Ivanti from more than 500 women working in technology across the globe. The number one piece of advice women would give to young females starting a career in tech? Know your worth! It’s tempting when joining a male-dominated industry to try to blend in. You may attempt to hide feminine traits or pretend to have an interest in things that you don’t. But 16% of women working in technology share how important it is to ‘try and stand out.’ Today, building a personal brand that is authentic is the key to success. Lastly, it could be an idea to ‘brush up on your maths/science skills’ with 13% of women working in the tech sector recommending doing so.